Lists of what to do before the event. Lists of what to do at the event. Lists of what to do after the event. Lists of how to promote the event. Lists of how to engage attendees at the event. Is not everything about an event professionals life - detailed in their multitude of lists? Of course it is. However - you don't want to miss this list - because it truly really will help every event professional grow and succeed. Events that engage. Events that excite. Events that create collaborations. Events that prove that spend'. Events that make it all worth it. Okay, okay. We're actually just sharing (more) of our favorite places to learn and grow as innovative event professionals - whether it's in event tech, event marketing, or event planning. (Or you know - the meeting planning, conference planning, and ________ equivalent term). Believe it or not, LinkedIn has a lot more to offer than just a search for the next event planning gig and/or career. And while connecting with others on LinkedIn is valuable and great - one of our favorite parts of LinkedIn here at MeetingPlay - are the groups. LinkedIn groups exist for pretty much any industry, topic, or interest one may have - and within the more engaging groups - quality content is shared, industry leaders share their insights, and a lot of lessons as well as encouragement is bound to happen. Pro tip: Don't just focus on the industry you're in - if event professionals are trying to attract hospitality events, or tech events, or college alumnus events - do a LinkedIn search for those groups. Engage - be active - prove that you are a thought leader by adding insights and offering advice and valuable tips. Believe it or not - Google has more than just a 'search function', and one of those amazing features happens to be Google Alerts. Google Alerts allows one to set alerts to inform them any time news is shared about a specific topic. You can update the amount of alerts you receive, when you receive them, and if you only want 'the best results' or 'all results'. Pro tip: Don't forget our previous tip for LinkedIn groups - follow the topics and industries/keywords you want to attract. Receiving news alerts is a great way to engage with potential clients, audiences, attendees - as well as discover topics of interest and notice, to help share/tell a brand or event story. Truth be told - you should be following your competition like a hawk. Not to be the peeping Tom - but to see what they are sharing, doing, and up to. 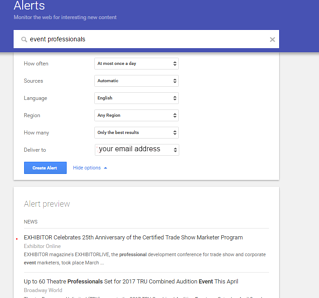 (Hint: Google Alerts is another great tool for tracking competition - add competitors as a keyword you track). Whether it means visiting 'ideal competition' (Dream competitors - who are targeting your specific desired client/business/event/etc.) 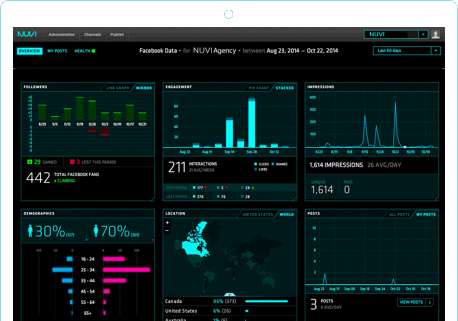 websites every day, or it means following their updates on social media, setting alerts up via Google Alerts or Mention.com - or utilizing a listening tool such as Nuvi or Infegy. Pro tip: Most event professionals or event companies don't have time to consistently be tracking all of their competition - pick your top 2 dream competitors and your top 2 dream clients and focus on them and what they are doing! Speaking of focusing on your dream client - and carrying through from number 3's 'Pro-tip' - keeping an idea on your dream clients is not only smart - but it's effective. If an event professional is actively engaging with a potential (or dream) client, whether through LinkedIn networking, social media, or even a newsletter or personal email every now and then - you begin to become top of mind when your dream client/event/business/etc has their next big affair. Pro tip: Don't be afraid to open the book the conversation - or keep the conversation going. Staying top of mind - means when the next occasion occurs - your dream clients are going to remember your efforts and you. Whether it's keeping tabs on competition, potential clients, or presenting one's self as an industry expert - the key to successful growth as an event professional - (regardless if you're an event planner, meeting planner, event a/v company, event app company, etc.) is being involved and continuing the conversation. Knowing what your dream clients are up to, being aware of your competition, and engaging with potential audience not only helps an event professional grow, it helps the brands they represent grow as well. Here's to more successful events!